Shrubs adapt to their environments in a variety of ways, and some developed prickly stems or leaves during their evolution. Sharp, thorny foliage helps prevent grazing by deer, rabbits or other wildlife that like to dine on landscape plants. Thorny bushes also provide protective shelter for small, beneficial wildlife. Thorns also keep wildlife and humans from tramping on shrubs, which makes them an excellent choice for natural hedges and barriers. 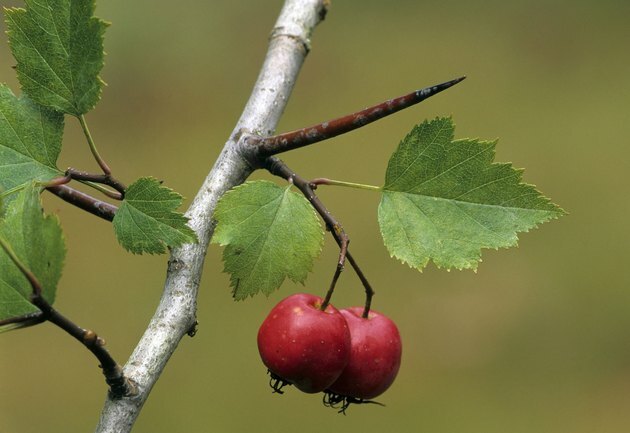 Boasting impressive 1- to 3-inch thorns on their stems, the many varieties of hawthorns (Crataegus spp.) can be grown as tall shrubs or small trees. With so many varieties to choose from, there is a hawthorn shrub for every gardener, no matter what U.S. Department of Agriculture (USDA) plant hardiness zone you garden in. These dense shrubs provide habitat and food for nesting birds. Hawthorns are native to North America and grow best in full sun to partial shade and moist, well-drained soil. Most varieties produce white flowers in mid-spring followed by small, red, bird-attracting fruits. Found in USDA plant hardiness zones 5 through 8, the wild rose (Rosa carolina) is a woody shrub that blooms from late spring through fall with fragrant, pink and purple blossoms. Flowers are followed by large, edible, red hips that last through winter. This spreading prickly bush grows up to 3 feet tall with a spread up to 12 feet wide. Thorns appear on all of the plant's stems but are more pronounced on larger stems. Wild rose shrubs prefer full sun and moist, well-drained soil. They're hardy, however, and can tolerate wet, dry and alkaline sites. They'll also do fine in windy areas and make good foundation or barrier plants. Like the wild rose, the Southern blackberry (Rubus argutus) grows only a few feet tall but can spread more than 10 feet wide with spiny, arching stems. Southern blackberries grow quickly in USDA zones 5 through 9, producing white to pink flowers in early summer, followed by large, edible fruits in late summer and fall. Southern blackberries can thrive in full sun to shade and prefer moist, well-drained soil. The catclaw acacia (Acacia greggii) is a large shrub native to the southwestern United States. Catclaw acacia can grow to 15 feet tall with a 25-foot spread and possesses large, twisted, extremely sharp thorns and gray-green deciduous foliage. The catclaw acacia blooms in spring with aromatic spikes of yellow blossoms that attract butterflies before growing into flat, brown seed pods. Plant this drought-tolerant shrub in well-drained soil and full sun anywhere in USDA zones 7 and above. Though this shrub is suitable for xeriscaping, it does look its best when irrigated regularly. If you want the benefits of a thorny plant and something that's attractive to look at, try a bougainvillea (Nyctaginaceae spp.). Boasting vibrant pink flowers, the thorny bougainvillea blooms almost all year long in USDA hardiness zones 9 through 11. There are many varieties available, growing anywhere from a foot tall to towering on trellises 30 feet high. Most varieties require very little care but do like full sun. If you live in USDA zones 5 through 9 and need a thorny, evergreen hedge, consider the Oregon grape holly (Mahonia aquifolium). Like most holly bushes, this one wears its thorns on its leaves and they're quite sharp, easily poking through tough materials like leather. The foliage of the Oregon grape holly emerges in shades of bronze and red, turning green as the leaves mature. The leaves change color again in the winter, taking on a deep purplish-red color. In the spring, this holly produces bright yellow flowers followed by blue berries. If you enjoy the look of the berries, plant at least two Oregon grape hollies. Doing so results in better fruit production.